The team practice today is similar in every way to each practice before. To repeat the success that yields championship results there can be no let up of effort, intent, or accountability. Everyone is responsible for the behavior necessary to become a champion. Everyone includes anyone who provides service and support to any member of the team. It could be an administrative secretary or an equipment manager who have nothing to do with gaining yardage, defending a goal, or scoring points but they contribute to the environment of champions. When everyone is aware, deeply aware, of the conditions necessary to process championship results they do not hesitate taking action and holding others accountable for that process. A team an organization has a higher probability of repeating championship success when everyone’s behavior is constantly focused on improving the conditions of others. Each individual is not concerned about their own personal power or privilege they are only concerned about making a meaningful connection for the greater good. They place others before themselves because they know their own power and privilege will grow as a result of their actions. Even the smallest of gesture are meaningful and have purpose. The more you know about the goals of others the greater meaning you deliver in your actions. For example at the end of each meaningful workout there is time for recovery and renewal. A common action for athletes to take after a practice is simply clean up with a relaxing shower. Prior to cleaning up you remove your gear and clothing. There are very few sports that equal the amount of gear and clothing a football player uses for each practice. For all athletes and sports there are organized systems for collecting gear and clothing that support getting the gear and clothing back to the athlete for the next days practice or game. Over the years I have lost a sock, worn a stinky tee shirt, and even had to practice in the wrong shoes because I did not understand the process for preparing my gear and clothing. I have also spoken with athletes at college and professional levels who have had similar experience. In every case the athlete, including myself, knows how to reduce the errors and continue with championship behavior. Seeing this picture at what point does the player’s role stop and the equipment management take over? What are the implications this picture poses related to a player using their power and privilege to hinder equipment managers performing at their championship level? Consider in this photo that you can see two very relevant conditions. One the bins are over flowing and two a third bin can be seen that has nothing in it. So what are the probable courses of action? This is not the first time I have seen a picture like this nor the first time I have asked championship teams to discuss courses of action. 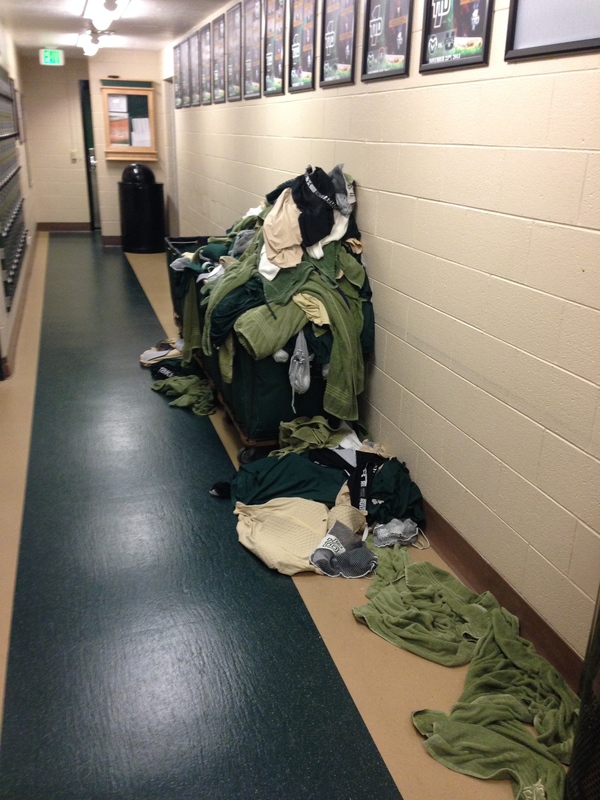 I agree there are people paid to clean the locker room, do the laundry, and distribute gear. But do you understand that if you make their job more difficult on purpose you increase the chance that they will fail? Do you further realize that if they fail you may not get all of your socks or your clothing maybe damp when it gets hung in your locker. So how would that impact your ability to perform? If a coach or a teammate uses their power to diminish your ability, because they can, does their behavior support your desire to encourage someone else? It is only laundry and equipment and someone else is paid to take care of. Why should I use any of my time or talent doing someone else’s job? Be a champion every season for as many seasons as possible. This statement has been realized by teams such as the Boston Celtics, New England Patriots, LA Lakers, New York Yankees, USC Trojans, Ohio State Buckeyes, Crimson Tide of Alabama, as well as IBM, or Apple. The process to become a champion is a series of outcomes connected together by each participant’s actions within the process. When every part of the whole are humble enough to find the empty third bin and contribute their power and their privilege in order to improve others it is only then the whole moves forward on a path of greatness. The most powerful outcome to desire are those that place others ahead of you first as you feel others doing the same for you.